Blackman, Allen, Rebecca Epanchin-Niell, Juha Siikamäki and Daniel Velez-Lopez. 2014. 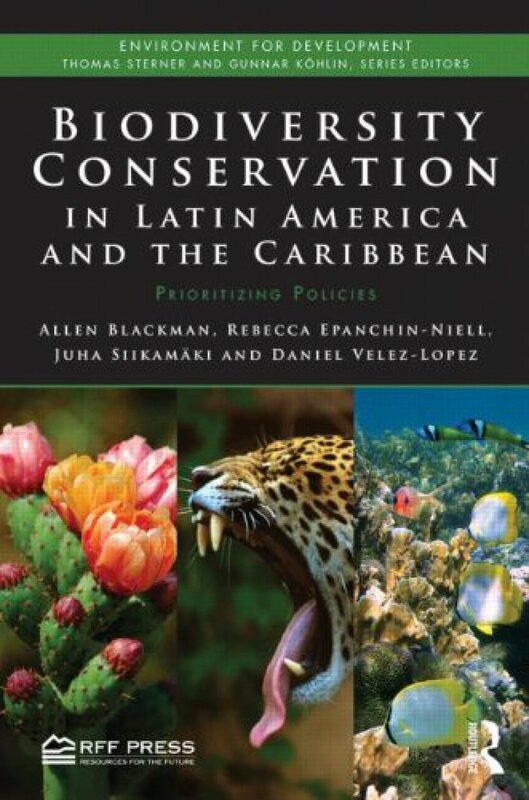 Biodiversity Conservation in Latin America and the Caribbean: Prioritizing Policies Published by Environment for Development. Latin America and the Caribbean (LAC) region is exceptionally biodiverse. It contains about half of the world's remaining tropical forests, nearly one-fifth of its coastal habitats, and some of its most productive agricultural and marine areas. But agriculture, fishing and other human activities linked to rapid population and economic growth increasingly threaten that biodiversity. Moreover, poverty, weak regulatory capacity, and limited political will hamper conservation. Given this dilemma, it is critically important to design conservation strategies on the basis of the best available information about both biodiversity and the track records of the various policies that have been used to protect it. This rigorously researched book has three key aims. It describes the status of biodiversity in LAC, the main threats to this biodiversity, and the drivers of these threats. It identifies the main policies being used to conserve biodiversity and assesses their effectiveness and potential for further implementation. It proposes five specific lines of practical action for conserving LAC biodiversity, based on: green agriculture; strengthening terrestrial protected areas and co-management; improving environmental governance; strengthening coastal and marine resource management; and improving biodiversity data and policy evaluation.